The first now has a name, the exo-bond, one example of which is the C2 diatomic. The hint that a quadruple bond could be formulated between the two carbon atoms goes back a little while (see Table 1), but revived interest really took off after ~2010, around the time my blog on the topic also appeared. You can see the abundance of post 2010 articles in the bibliography at the Aachen bond-slam. At the conference, four speakers all agreed using rather different methods that there was indeed “something” additional to a C≡C triple bond and that this “something” might be worth ~15-30 kcal/mol of stabilization.† The debate centered around whether this term deserved to be called a bond, or whether it should be downgraded to merely that of biradicaloid stabilizations.‡ The more conventional population of a σ*-antibond it was argued would not result in such stabilizations. Since many kinds of bonds have stabilization energies of similar magnitude, not least the weaker hydrogen bonds, agostic bonds, halogen bonds etc, let us for the sake of argument call it a bond here. Because four electrons might occupy the same space along the σ-symmetric C-C axis, they experience significant so-called static correlation∞ which results in partition into one electron pair occupying the central region (the endo-bond) and the other pair in the outer region (the exo-bond). This separation decreases the Pauli electron repulsions along the entire C-C axis region. An example of an exo-bond is found in [1.1.1] propellane, where the notional central C-C bond is thought to actually occupy the region outside the central C-C bond axis, but largely in this example because of angular strains. In this case however, the propellane bond is not competing with an endo-bond along the same axis. We might conclude therefore that the convention of characterising a bond using the separation between the two nuclei (the bond-length) is rather stressed when one has two different bonds along the axis of the nuclei, one of which is obviously “longer” than the other. Which brings us to representations; e.g. Chemdraw now allows drawing of quadruple bonds and so it can be drawn thus quite simply. The second form breaks the century-old convention that all bonds along a diatomic axis are drawn in the same manner, by isolating the exo-bond to make the point clear. Perhaps we should stick to the first, but be prepared to explain the underlying complexity of the quantum mechanical symmetries as we do to students with σ/π/δ/φ bonds, which are another mechanism for avoiding having bonds in exactly the same regions. I know the story has not yet ended; but is it time to at least speculate when the text-books will start to reflect/discuss the exo-bond? The second I dub the hyper-bond. This goes back to G. N. Lewis and his famous octet rule for main group elements, the expansion of which was subsequently described by the term hypervalent. That term has become rather confused with hypercoordinate, since hypervalent is often used to describe hypercoordinate species such as PCl5, SF6 or I.I7. But this does rather break the original definition, since few if indeed any of these hypercoordinate molecules have a significantly expanded octet shell. At the Aachen meeting, a molecule fitting the original definition was presented, appearing first in early form on this blog. 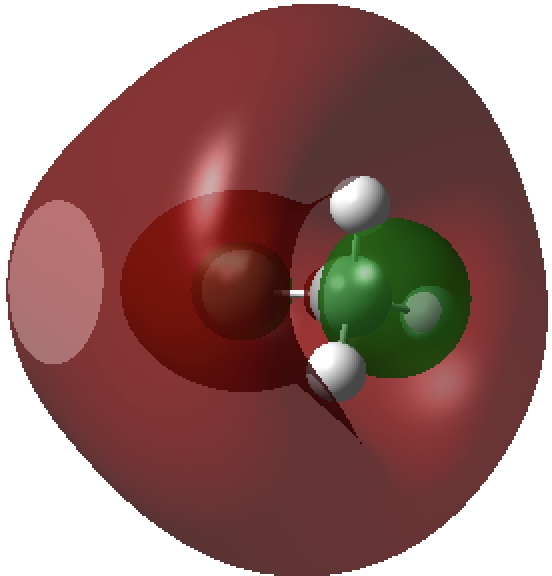 Put simply, a wavefunction for CH3F2- can be calculated (ωB97XD/Def2-QZVPPD/SCRF=water, DOI: cb3n ) for which the two additional electrons populate a molecular orbital with significant contributions from the 3s/3p valence shell AOs (atomic orbitals) for both carbon and fluorine. The alternative would have been to populate the anti-bonding C-H or C-F orbitals composed of 2s/2p valence shell AOs. The former results in a total population of these higher valence shells of 1.55e and makes the C-F (Wiberg) bond order >1 (1.14) and the total Wiberg bond indices >4 for carbon (4.162) and >1 for F (1.275). The resulting HOMO (highest occupied molecular orbital) or NBO (they are very similar) looks as below. It takes the approximate form of a torus or cylinder wrapping the inner C-F bond, a second layer to the C-F bond if you wish. Normal valence shell F-C σ-orbital defining the regular C-F bond. 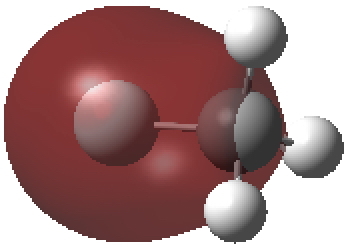 Higher valence shell F-C σ-orbital defining the C-F hyper-bond. Rather than the entire molecule being defined as hypervalent, only one (in this case localized) orbital is given the term and the other orbitals are conventional. In both cases the molecules are either very reactive (C2) or with such a low barrier to fragmentation (into CH3– and F– for CH3F2-) that detection of the latter is unlikely. But these are interesting Gedanken experiments in quantum mechanics, which in turn catalyse the development of new techniques and in some cases might even lead to the design and isolation of new types of molecules. †The known thermochemistry of the two reactions; HC≡CH → HC≡C + H•; HC≡C• → CC + H• is ~17 kcal/mol less endothermic for the second step, suggesting some factor is needed to account for the additional stabilization when CC is formed. ‡The singlet to triplet excitation energy for C2 is ~+30 kcal/mol, so the biradicaloid electrons are certainly spin-coupled. ∞Other “difficult” correlated molecules include Be2 and B2. This entry was posted on Wednesday, September 6th, 2017 at 7:28 pm and is filed under Bond slam, Interesting chemistry. You can follow any responses to this entry through the RSS 2.0 feed. You can leave a response, or trackback from your own site.